Christmas has come and gone, and the holiday season is almost over. New Year’s Eve fast approaches and you may be working on that list of resolutions and things to do. If you make and keep any resolutions for the coming year, make them good for you and your home, like staring the year with a new roof. Get a New Roof for a New Year. Of course, you may not be sure you need to invest in a new roof, particularly if you haven’t noticed any problems. So, start with a roof inspection. 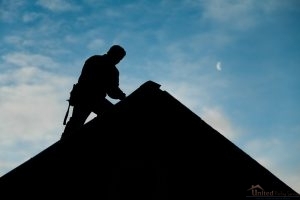 A professional roofer will check all parts of your roof system. Your shingles, sealing, gutters, and more need to be inspected for cracks, leaks, dents, holes, rot, mold, and much more. Your roofer will perform a thorough inspection of a broad detail range. Since even a small problem can become a larger one, you will want to have anything found repaired as soon as possible. If your roofer does find something during the inspection, make having it fixed as soon as you can part of your resolution list. Hopefully, you will not have to make any drastic, expensive repairs. If there are any issues, waiting too long could create more damage. If you have to get a temporary solution while you figure out your finances, then ask your roofer about your options. Of course, if your roof is old, or has multiple problems, a new roof could be in order. Whether you need a few minor solutions, or a new roof, taking care of it all in the new year means you’ll be set for the rest of the year. Call United Roofing Services at 816-228-1158 and let us help you start the year off right with a new roof in Grain Valley, MO. Posted in Uncategorized on December 27, 2017 at 5:20 pm by United Roofing Services.